Tarot for Change: Do you need to be a psychic to learn tarot? 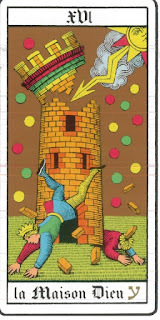 I stumbled upon tarot in 2011, when I was going through a major life change, a divorce. I hadn't had any particular interest towards tarot earlier, because I regarded it as either a hoax or something only psychics and mediums use - and I wasn't sure I'd believe in those concepts either. The left-brained science geek, you see? But what do you know. On a whim, to distract myself from the heartbreak, I ordered a free online astrology reading (funnily enough I found astrology more plausible than other forms of "alternative" or "esoteric" knowledge) which happened to come with a complementary tarot reading. My first encounter with tarot cards was pretty much simple, pure shock and disbelief. The three card reading delivered cards called Death, Tower and Hanged Man. Pictured: Hanged Man and Tower from the Tarot of the Magicians, Oswald Wirth 1927, based on the Marseilles Tarot from 1499. It summarised my situation to a T: I was going through a major personality change and life change, my surroundings and circumstances were crumbling from what I had previously assumed and planned; and I couldn't move out just yet due to financial reasons and having promised to my soon-to-be ex-husband that we'd discuss the break up properly, neither of us would just escape. 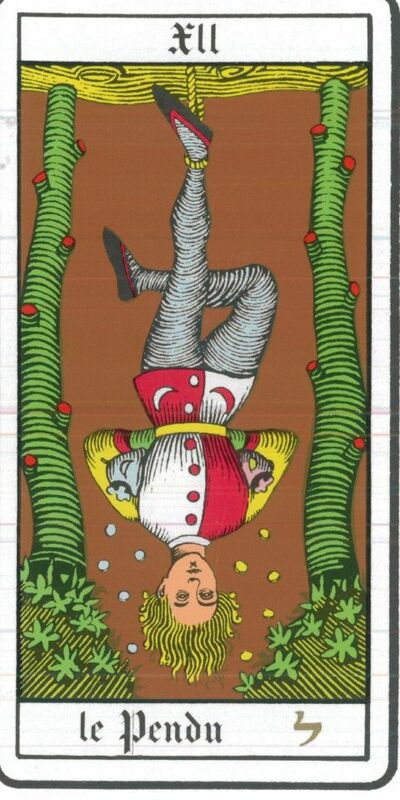 So there I was, watching myself and my life dismantle, yet hanging in there at the scene because I had made a promise - - - Hanged Man is the card of self-sacrifice and change of perspective. Of course I didn't simply know what the cards meant, when I saw them. But the imagery is so visceral I got a hint what they could mean and was shocked and curious enough to start studying. I read everything I found online about these specific three cards. Then I read some more about other cards. I learned about the Major and Minor Arcana, the different parts of a standard tarot deck. 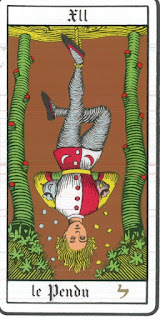 I learned that all those cards were Major Arcana, meaning that they were not mere everyday events or feelings, but much more profound and even life-changing. And I kept reading more, and started doing free online readings for myself to learn more. The more I read about tarot and the more I did readings for myself - first with online decks and then with my own paper copy of RWS (Rider Waite Smith, the "classic" tarot) deck, I realised that these specific cards could not be a coincidence. Not after repeating so many times, and conveniently fading away from my readings when I started feeling better and healed from the emotional turmoil. But, now to my question: do you need to be a psychic to learn tarot? Well, what is a psychic anyway? If it means someone who is well connected with their intuition, then yes, it does help. But even that is not a prerequisite. An analytical and logical person can do equally well with cards, that's the beauty of it. I've read cards for five years now and I have been a very structured and methodological reader, relying on the set book meanings of each card, and I'm only now venturing towards the intuitive style: relying more on instant feelings, emotions and flashings of "knowing" when I see each card and the whole spread. Tarot is a language and each card is a word, description or concept, just in a symbolic form. It can be learned like any other language in the world. Some people seem more naturally prone to learning and some struggle a bit more, but it's possible for anyone. You'll only need an open mind to look at what you see without bias or preconceptions. And then tell yourself what is it you see and how it fits in your life (or, someone else's, if you're reading to another person). More about reading tips and techniques coming up soon!